Summit of Nirekha peak (6150m), an alpine ascent. Summit of Cholatse (6443m), an alpine ascent of a new variation of the normal route via a direct coulior to 5700m then SW-ridge. 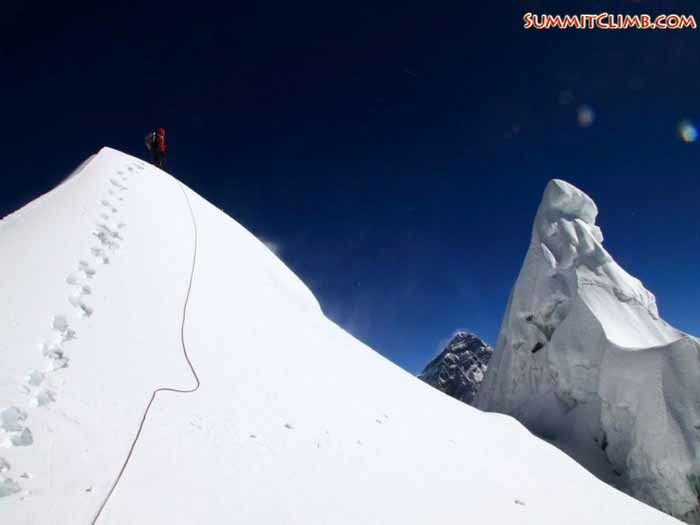 Summit of Island Peak (6200m), solo speed ascent in 2h 57min from 4950m. We did not manage to climb the technical demanding route planed up the North face of Cholatse though, but considering the bad conditions through all the snow and wind of this season, at least we came down safe again. That should be the main goal anyway. With that I wish all our readers all the best, thank everyone for their interest and support! Robert in front of Cholatse North Face. Robert on the way down traversing the exposed summit ridge on the southern side (Felix Berg). Hello SummitClimb news, this is Felix Berg the leader of the Cholatse expedition. To summarize briefly, on the 21st I joined an American team on Island Peak. We made it to the summit very quickly from basecamp and back down. After that we had a day of rest and went down again. Robert on the summit of Cholatse. 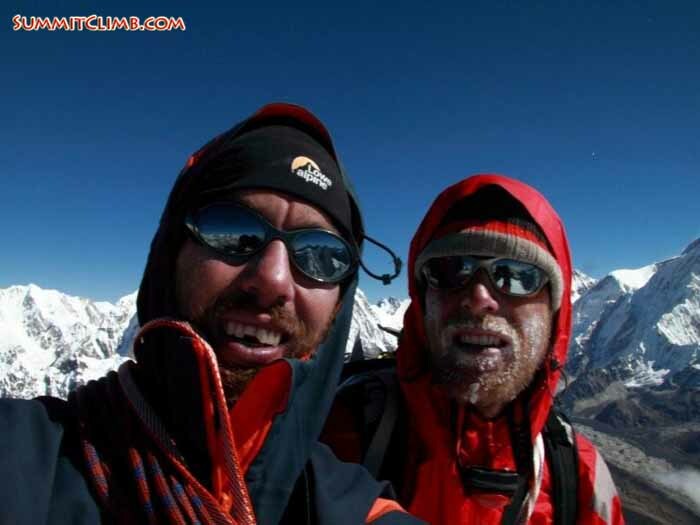 On the summit: Felix left with broken tooth and Robert on the right all iced up (Felix Berg). 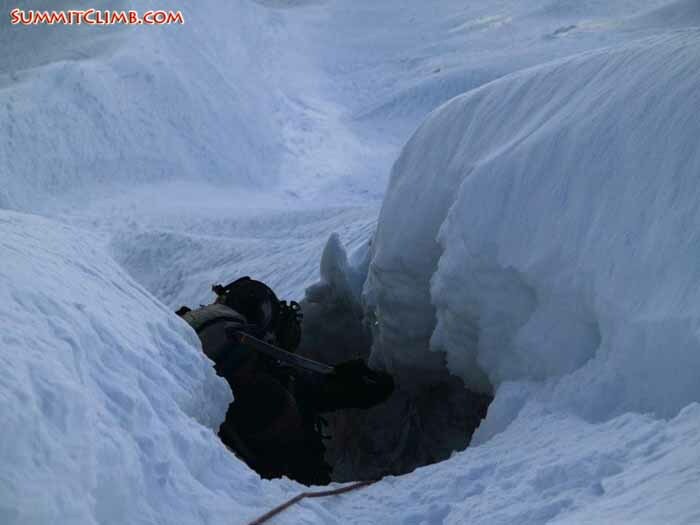 Robert in the tunnel on the last pitch to high camp of Cholatse at 5700m (Felix Berg). Unfortunately, Robert hurt his knee a few days ago twisting it on rocks that moved underneath him, so he can’t climb for the rest of the expedition. Yesterday I climbed up the north face of Cholatse on my own, but it was too dangerous, so I turned around at about 5400 metres/17,700 feet. It seems there is too much snow up high and that the north face of the mountain is not safe. Here is a brief description of our Cholatse team's movements the past week from Felix Berg. 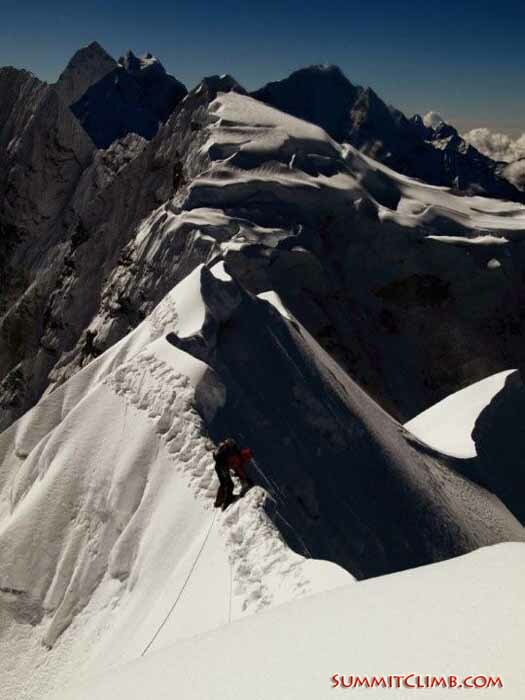 8 Oct: passed Cho La Col 5360 metres/17,600 feet in bad weather, snow storm. 9 Oct: hiked to moraine camp, 5100 metres/16,700 feet - first sunny day! 10 Oct: climbed to high camp 5700 metres/18,700 feet, in col behind gendarme. Deep snow in upper couloir, 55 degree slope with steeper sections. Broke my two front teeth as a carabiner snapped against them. 11 Oct: start 2:00 a.m., summit 9:20 a.m., deep snow, and high avalanche danger. On the ridge this was mainly acceptable. Descent to camp. 12 Oct: Descent to valley, I started hiking out. 13 Oct: Now in Namche, checking on my tooth. 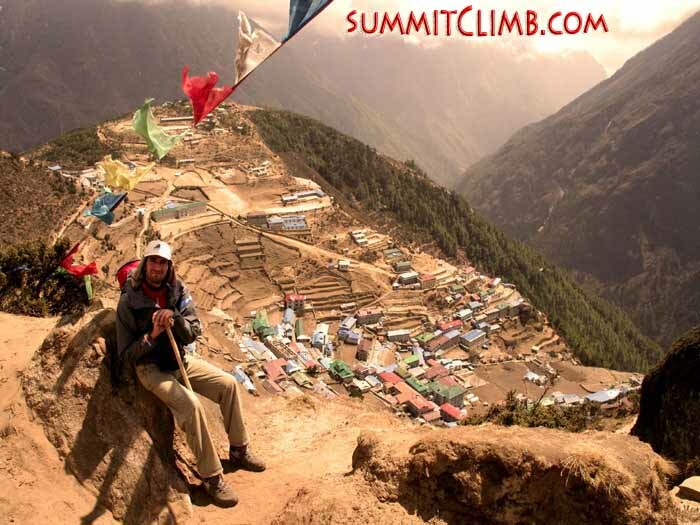 Hello SummitClimb news, this is Felix Berg, the leader of the SummitClimb Cholatse expedition. We’re back in basecamp and it has been raining heavily the last few days. So we haven’t done much progress on the mountain and have been mainly hanging around camp and doing some fun hikes in the surrounding area. Yesterday we reached 5800 metres and had had a chance to look around and see stunning views, despite the rain. We arrived at Cholatse basecamp 2 days ago on the 22nd. There was mixed weather, so yesterday we spent all day walking around and acclimating up to 5100 metres/16,700 feet. Today the weather is good again and we’re going to hike up to Chola Col, which is at about 5600 metres/18,400 feet to get acclimated and spend a few nights up there. Namche Bazaar, the capital of the Sherpa people. See this unique village on our trek to and from basecamp (Tunc Findik). Our 3rd post-monsoon expedition is on the way. We look forward to exploring a new mountain, possibly a new route in the Khumbu valley with the peak of Cholatse (6400 metres/21,000 feet). Our team consists of Felix Berg and Robert Steiner, both from Gremany. 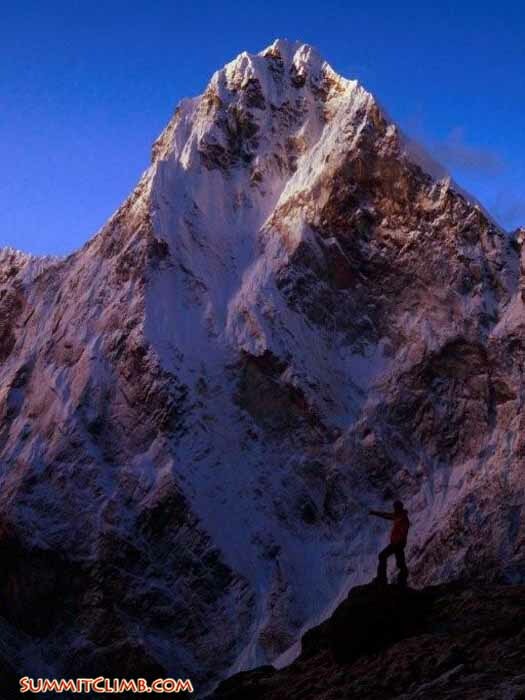 We plan to climb in alpine style, keeping our approach light, flexible and inexpensive. Our flight from Frankfurt to Dehli with Air India was the first interesting experience. No problem with the check-in, old-fashion living room design and movies, but quite good food, our landing went quite rough and ended with a full-break and squeaky landing. Waiting at the Delhi airport over night we got very excited to reach Kathmandu, now finally we are here.